The story is a slice-of-life comedy revolving around a NEET Panda who gets a part-time job at a zoo. He meets and befriends Polar Bear and Penguin, and, along with his zoo animal co-workers, they frequent a popular and well-kept cafe run by Polar Bear. In the Shirokuma Cafe world, sentient animals and humans co-exist peacefully. Despite its skeleton of a plot, the show was quite popular during its airtime, and racked up 50 episodes. 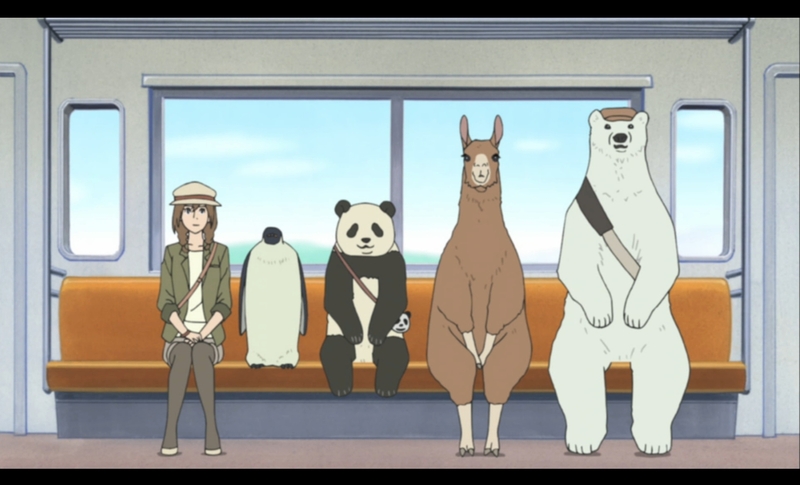 1) Cute talking animals that sit around all day drinking coffee and occasionally snarking at each other doesn’t sound like much, but the show is wonderfully addictive with its smooth animation, engaging dialogue, and funny jokes (mostly at the expense of other characters – Penguin and Llama being the usual victims). Occasionally, the animals teach each other or Sasako (the human waitress of Polar Bear’s cafe) some fun animal trivia, which you can then show off to your own friends. 3) The humour is, for lack of a better word, somewhat mundane. A lot of shows that belong in the slice-of-life genre get ridiculous a few times to mix things up (ex: Lucky Star, Nichijou, Azumanga Daioh…) but Shirokuma Cafe stays strictly on the side of normality. Well, as ‘normal’ as you can get in a world where animals can talk and drink coffee. They operate almost strictly within the constraints of the universe given to them, and so all the humour from Shirokuma Cafe is through the interaction between the characters, and the situations that their daily lives throw them into. 4) It is a very easy to watch anime! There is no extravagantly long or complicated plot to follow; the humour is fresh and simple; the characters are enjoyable and/or likable who develop enough so they’re not stagnant, but not enough so that viewers who miss a few episodes will be lost. This allows viewers who want something cute and (for lack of a better word) meaningless to jump in and enjoy. 5) Polar Bear’s love affair with puns and everything that came out of Panda’s mouth were extremely relatable on an almost spiritual level. and i think i found what i want to watch next, i never heard or seen this anime before and its intriguing how most of the cast are animals. and with 50 episodes nonetheless i’ll check it out thanks ^_^ . what?! 50 episodes isn’t enough?? that’s great!